Many were shocked to hear that Pope Francis—widely celebrated as one of history’s most progressive pontiffs—refused to apologize to victims of Canadian residential schools when asked to do so by Justin Trudeau, on behalf of the Truth and Reconciliation Commission. National Chief Perry Bellegarde of the Assembly of First Nations has personally written to the Pope to invite him to Canada for a meeting with Indigenous people here. So far, the Pope hasn’t responded, and while it can be safely assumed that he won’t be knocking down our door anytime soon, there’s no better time than the present to evaluate the implications of this curious move by the Catholic Church. It is curious because, in recent years, the church hasn’t shied away from apologizing for similar wrongdoings it was involved in. 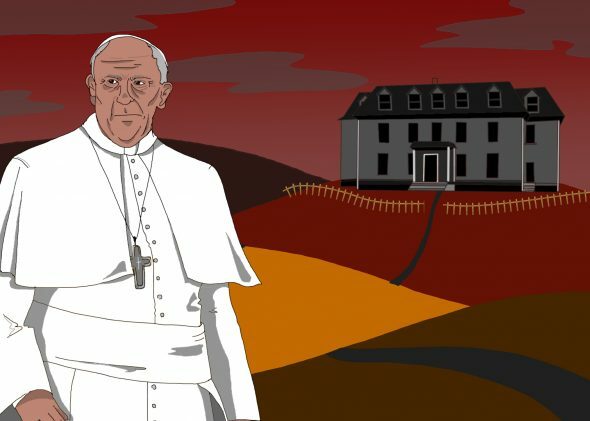 In 2010, Pope Benedict offered an apology to Irish victims of sexual abuse perpetrated by members of the church, and in 2015, Pope Francis himself apologized to Indigenous Americans for the harm caused by its part in colonialism. Even stranger is that, of all things, the Pope refuses to say sorry for Canada’s residential schools, two-thirds of which were actively operated and overseen by the Catholic Church at the time. That’s about 85 schools designed to assimilate Indigenous children at whatever cost. That cost, as proven by countless records and first-hand accounts, was the unspeakable abuse of those children. Without any solid reason for Francis’s refusal to apologize, it’s nearly impossible not to wonder why the church won’t accept responsibility. If he feels he cannot atone for an effort he did not individually partake in, why apologize for the victims of colonialism in the United States? As the head of a faith rooted so firmly on tradition, it seems illogical for the Pope to separate himself from history and his church’s place in it. Canada, as a nation, provided a direct apology for residential schools in 2008. The Truth and Reconciliation Committee was born out of this effort to stand in solidarity with the First Nations of Canada, and while progress has still been slow on matters like the Inquiry into Missing and Murdered Indigenous Women and Girls, these apologies do have significance for the communities to which they are addressed. The sadness in this story is that, according to those in power—and Forbes lists Pope Francis as the fifth most powerful person in the world—the simple gesture of saying “I’m sorry” is too much effort, or humiliation, to bear. All while Indigenous Canadians have spent decades struggling to recover from the intergenerational trauma thrust upon them by colonial powers, one of which remains the ever-rich and ever-influential Catholic Church.